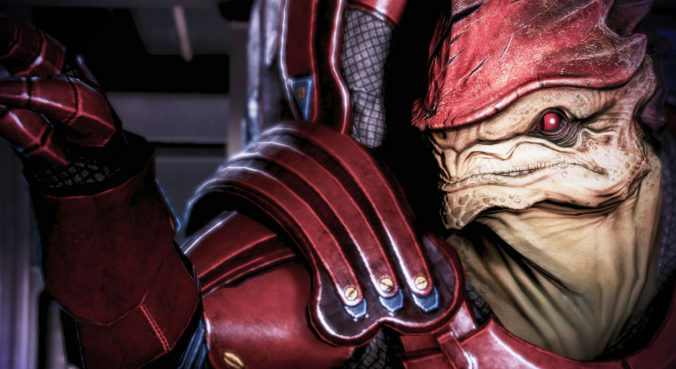 Ever since Star Trek and loving Klingons I have been a sucker for the ‘warrior’ races in science fiction so it’s not a huge surprise that Wrex quickly became one of my favourite characters in Mass Effect. Although Wrex may seem like the typical Krogan at first, he is in fact very different from the rest of his species. He’s brash and loves to fight for sure, but Wrex is amazingly clever. He was the youngest tribe leader in a thousand years, he killed a Tresher Maw during his Rite of Passage, and he very much believed in the honour of being a Krogan until his father made him disillusioned by it. He is not the brainless mercenary he appears as. Even after leaving Tuchanka, Wrex still has all his smarts with him and is good enough to spot a trap when he sees it (ex: when he almost works for Saren). While he may dismiss it as being old, the fact that Wrex gets sentimental over his grandfather’s armour (if you choose to find it) as well as admitting that he went to the Crush because of his father (despite knowing it was a trap) makes it clear that there is still some part of him that expects more from the Krogan. He may brush it all off when you talk to him but it’s the first first time before Virmire that we see how deeply Wrex feels about his roots and his people. Throughout the first game if you talk to Wrex he has nothing but scorn for his people whom he once thought deserved to find a cure for the genophage. However, once reaching Virmire it is clear that the genophage is still haunting him. Even the hint of a promise of it being solved has Wrex thinking of his people again. He is almost willing to kill Shepard over it if they don’t talk him down. Underneath all his brashness, Wrex still loves his people and that becomes even clearer in the next two games where he does everything he can for them. Becoming a clan leader and getting involved once more in the politics of his people isn’t what Wrex loves… However, he knows that someone has to step up and control the situation to fight the greater threat of the Krogan’s extinction. He’s smart enough to realize they need to work with Mordin if they’re going to be cured (though still cautious of this union and ready to fire back at the hint of betrayal). He also realizes he has to hold his own at the Summit , especially when other races say they could cure the genophage, but only after the Reaper threat is gone. While I am not saying that all Krogan are mindless (as they clearly do have the smarts to get back at certain people when they want to), in Wrex’s place Wreav can be tricked if you sabotage the genophage. He’ll think it’s cured, whereas Wrex is too smart and will confront you about it later. It is Wrex who is the one capable enough to recognize what is needed to save his people and the one who can check if it truly worked. At first he is standoffish to everyone on the Normandy, but it is clear his time with them has made Wrex care about his squadmates as though they were part of his clan. That doesn’t mean he isn’t direct with them when he thinks they’re making a mistake, as when he tells Garrus that the Turians ensured the Krogan would die out through the genophage or when calling out Victus when he finds out about the bomb on Tuchanka. He is not one to soften the blow of his words in any way, but if Garrus or Liara are brought with you to Sur’Kesh, he will express his thanks to them for being there in his own “Wrex” way. He’ll even admit to Tali that he worries about her in the Citadel DLC. It’s also clear how much he missed Shepard when he greets you on Tuchanka. It’s not hard to think that in the future when Wrex and Liara outlive the rest of the squadmates they’ll reminisce about their past friends. While Wrex will shrug it off, he’ll still clearly care. I’m not saying Wrex is soft, he’ll shoot you and laugh about it later if it suits him. He buried himself in However, when it comes down to it Wrex is a true Krogan, much like how he always pictured his race, in his words “proud and fierce” and after the events of Mass Effect no longer a mercenary for hire. He’s a true revolutionist for his species . The Krogan lost their way temporarily, but Wrex found it again. He showed the galaxy what the real fighting force of the Krogan was like.